Employers in the United States added a lower-than-expected 126,000 jobs in March, according to the US Labor Department, following 12 straight months of gains above 200,000. Economic observers say the weakened economic growth is due in part to harsh winter weather, especially in the Northeast, a drop in oil prices, and the sluggish construction sector. Manufacturing and government both dropped jobs, while restaurants positions fell steeply from February. "While March's numbers aren't as robust as we've seen over the last year, overall trends remain solid, and there is every reason to be optimistic about our economic trajectory going forward,”said Labor Department Secretary Thomas E. Perez. “We've made incredible strides since the depths of the Great Recession, but there's more work to do to make sure every person can benefit from this recovery. There's more to do to strengthen and grow our middle class." 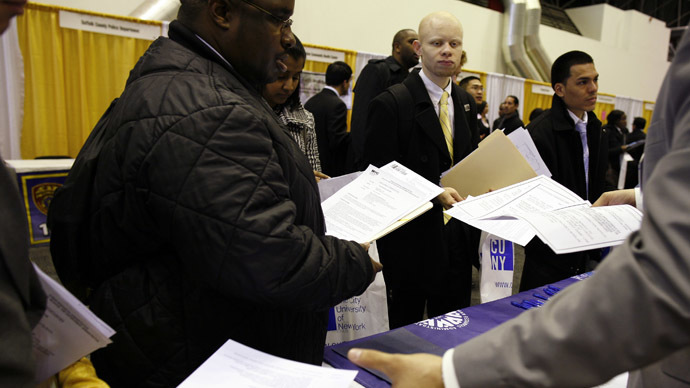 The unemployment rate remained at 5.5 percent, the Labor Department reported. Average hourly wages went up by 7 cents to $24.86 an hour. Employment gains in February and January were adjusted down by 69,000 jobs. Long-term unemployment dropped to 1.6 percent, which is 0.7 percentage points below its level from a year ago. The labor participation rate remained at 62.7 percent, suggesting many Americans who have left the workforce have not changed course. In fact, at 62.7 percent, the labor participation rate is at its lowest since February 1978, with 93.2 million Americans on the outside, according to zerohedge.com. “This was a very disappointing jobs report, and the dramatic falloff in employment growth confirms the emerging narrative of slowing growth momentum seen in the other economic indicators,” Millan Mulraine of TD Securities told the Wall Street Journal. Other analysts said the recent drop in oil prices is still impacting employment numbers. Insiders say the strain on employment growth in March will likely mean the Federal Reserve will keep interest rates near zero for a while longer. Others said the March jobs report won’t change many minds at the Fed.